Just released - X-Men: Days of Future Past trailer - and it is really awesome! Coming May 23, 2014. And just look at the cast: Hugh Jackman, Michael Fassbender, Patrick Stewart, Ian McKellen, James McAvoy, Jennifer Lawrence, Nicholas Hoult, Anna Paquin, Shawn Ashmore, Ellen Page, Peter Dinklage, Halle Berry, Omar Sy, and Lucas Till. Here are the upcoming movies for November! As always, descriptions courtesy of the IMDB. Snarky comments by me. THE movie to see in November!! Looks awesome. And already scoring great reviews at Rotten Tomatoes. Not the type of movie I see in theaters, but it does look quirky. So epic, I’d never heard of it until now… But what else are you going to take the kids to see after Thanksgiving? Madeline Mora-Summonte just released a book - The People We Used To Be. The stories in this flash fiction collection are like day trips - brief, illuminating journeys - across the landscape of the human condition. Congratulations, Madeline! L.G. 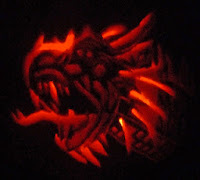 Keltner carved one wicked dragon pumkin!! Excited about the next X-Men and Hobbit movies? Any movies you plan to see in November? Think LG’s pumpkin is cool? And can you name any of the authors…? And now scroll all the way to the bottom - my name in lights, courtesy of the awesome Jeremy Hawkins! Surely not first? Bet someone beats me to it! Want to see Thor, Hunger Games (sorry Alex!) and Book Thief. Looking like a great movie month ahead. That pumpkin carving is fantastic, must have taken ages, well done LG! Ooh, I can't wait to see Thor! A great review of films to look forward to. OMG OMG OMG!!! Talk about a wake up from heaven!!!!! Those two trailers ... EEEEEEEEEEEEEEEEEEKKKKKKKKKKKKK! Seriously awesome. LIke, kick @$$ awesome. Need to watch now! Need coffee, too. Baby has me up a bit TOO early. That pumpkin is amazing, I'm carving mine today but it won't be anywhere near that good! I agree. Thor looks awesome! I'm excited to see that one. Ender's Game...hmmm. I haven't read the book. I'm not sure what bothers me about the trailer, either. There's something that just doesn't excite me about it. Hopefully, I'm wrong. I love both the Xmen and Hobbit/LOTR concepts. What I like so much about the X-Men is that there really is no true villain. Aerich and Charles started their vision together, and always had the same motivation and end result. The methodologies is all that is different. Does it make me a sick person that Magnito was never a truly bad guy to me? Misguided, yes. Morality is such a fickle concept. I think the producers of The Hobbit and LOTR have done justice to the written novel. JRR would be proud of the concepts. I've read Ender's game also, and am anxious to see if the movie producers can capture the main plot of the story. I need to pick up The Book Thief and read it before I see the movie. It seems like one I'd like to book better. Wife and I watched X-Men trailer, looks awesome... I didn't know what the heck was going on. Sadly I am still refusing to see Hobbit II/III in the theater, I don't think "We are walking" for another 6 hours cannot wait until the blu-ray release. Oh, THOR is the one we are going to see, though I plan on taking off my shirt every time he does. Kind of a reverse on the drinking game. Not interested in Hunger Games and no nothing about Ender's Game, except the score... that is really great. Of course it's not because I am friends with the composer or anything. Have a grand day and thank you! I loved the Hobbit book, but I can't wait to see what happens in the next Hobbit movie. My family can't wait for X-Men and Thor. Suzanne, you are first, and go enjoy Hunger Games. Terri, you are wired! First laugh of the morning. Sheri, think it will be good. Donna, not the first time Xavier and Magneto have worked together. And I think they've done The Hobbit justice. Jeremy, reverse drinking game - I like that! So many movies I want to see this month-Enders Game, Thor, and The Book Thief. I want to see The Hunger Games one but worry I'll be disappointed. I want to see Thor and Catching Fire in Nov., but the X-Men?!?! That's going to be awesome! May can't get here quick enough. Thor and Catching Fire are on my schedule of To See films. Ender's Game and Catching Fire without question. Also would like to see The Book Thief, Thor 2 and Frozen. The latest X-Men movie is going to be awesome and trailer blew me away. Thanks for the movie fare Alex. I will definitely be there for The Hobbit and Thor, but I don't like X-Men movies. Wow! The new x-men looks awesome! A lot of good movies on the horizon. I don't remember there being so many good movies coming out in November before! I plan on seeing at least three of those. I haven't seen Hobbit yet. I may watch them all three at the same time after all three are out. Looking forward to seeing Thor! I'm excited to see both THE BOOK THIEF and CATCHING FIRE. Your name in lights is awesome! I really will have to make plans to see some of those movies, especially the X men. The Desolation of Smaug looks really good too. Wonder who I can get to go with me? Like your name in lights, way to go. dude...i cant wait for xmen...it looks great...and hobbit...and thor...i am such a sucker...ha....i will be broke bu happy...smiles..
Keith, set aside an entire Saturday for that. Madeline, you're welcome! And didn't Jeremy do an awesome job? Glad everyone is excited for the next X-Men - that trailer gave me chills. Must see Thor and X-Men. Very curious about The Book Thief. I love WWII time movies. Kids want to see Frozen I guess that will be the highest priority. Love your name in lights! Great job by Jeremy as always! Days of Future Past and Desolation of the Smaug look epic. I will definitely see them in cinemas. The Wolf of Wall Street is not opening in November but rather on Christmas Day - December 25. I will definitely see this one in cinemas. Can't wait to see The Book Thief and Catching Fire! I am seeing Ender's Game this weekend. It looks awesome. Some great looking films, I'm defo looking forward to the new X men film. Hop the Hobbit doesn't bore me to tears like the first one did???? There are a lot of good movies coming out in November that I want to see. I'm happy to see all the familiar faces in X-Men. I never read any of the comics but I've enjoyed all (well, most)of the movies. That's a lot of great movies coming. I may even have to leave the house to see one or two. Thor and Ender's Game for sure, Last Vegas maybe too. Can't wait for x-men, anything beats x3, hopefully it is good. I'm missing out. I gotta get to the movies more often. I just read and reviewed Madeline's book and couldn't recommend it any higher. I actually really dug your movie forecast, Alex. What? You don't want to see Catching Fire? Did you see The Hunger Games? Me and Dave just loved it and can't wait for Catching Fire. Then again, I'm a huge fan of Jennifer Lawrence - and can't wait to see her in X-Men, too. And Thor... gotta see Thor. Looks like it's going to be a great movie season! Oh, we went out to see Escape Plan last night and it wasn't as bad as I thought it was going to be. It was really pretty good. Ol Sly and Ahnold kept me on the edge of the seat and provided me with more than a few laughs. So yeah, I recommend it. As for Trivia, I think the first one is William Peter Blatty or something like that. I was going to say Stephen King for the Dark Tower, then saw the date... so I have no idea.. Yup, I'm a real wiz at trivia. That pumpkin is just amazing and your name in lights is trés cool. Happy Hallowe'en! another X-men? Wow. That franchise is one of the most productive yet, I guess. The pumpkin is amazing! I will not be seeing the Book Thief, that book was 'Jews in nazi Germany' stories that doesn't end well. I'd never pay to see it (unless the wife makes me). X-Men does look pretty amazing. I'm surprised. Lessee - trivia. I'll guess Tim Powers, Stephen King and H.P. Lovecraft - no idea about the others though. OMG - I'm salivating after those trailers, and I adored The Book Thief. I will be one of the many at the next Hunger Games, Thor and Ender's Game too. So I'm not the only person who isn't a fan of The Hunger Games? Glad to know that! I'm curious about the Wall Street movie and that X-Men trailer is really awesome. So happy for Madeline, I love her stories. Go L. G. that pumpkin is awesome and really took some time! And movie season has arrived! Wow! I think #4 is Tim Powers (must resist urge to Google). Wow! What a cool pumpkin! I can't wait to see the second Hobbit movies as well as Catching Fire (still need to read the book for the latter). LOVE the X-Men trailer. Also, I'm a huge fan of Richard Armitage and Tom Hiddleston of course, so I can't wait for Smaug and Dark World. Already purchased my tickets for Ender's Game and Catching Fire. Looking to be a great movie season. And for some reason I thought you hadn't read Ender's Game. I can't wait for Thor! So many good movies coming out soon! No movies coming up that I'm super excited about, but then again I don't super excited about any movies like I used to. I adore The Hobbit. And I'd like to see Catching Fire, The Book Thief and Ender's Game. Ender's Game was such a powerful book for an MG - I wonder if they'll soften it up a bit for the screen. I HATED, HATED, HATED the freaking Book Thief and the massive hype around it. The fact that there's now a movie based on it makes me hate it even more, knowing it'll take twice as long for all the obnoxious squeeing to die down. Ender's Game must be very different from the book, always the same. In reading the book imagine us in the film imagines the director! Yeah Thor!!! Woot woot! I can't believe these movies coming out. Finally a bunch of choices. Although I probably WON'T go to see The Hunger Games: Catching Fire. I'm with you. Box office will not suffer if I don't go. WOWOWOW. Your name in lights. Love it. So cool! That pumpkin is terrific. Gotta let the kids see that one. That X-Men trailer is so bodacious! I cannot way till May. So many good movies coming out!! I forgot about the second part of The Hobbit. Can't wait to see it with my kids! PS: Lol on the Ding Dong thing. Pat, three out of five! Cathy, you got one right. Sorry, Hunger Games just didn't do it for me. I will watch Escape Plan on NetFlix though. Rusty, you might have to see it... And you got three right! Julie, you are not the only one! Ilima, I read it this past summer. It was all right. Juliana, that sounds like a fun day to me! Gwen, I wonder if they will make it more intense? That's an impressive bit of carving. The hobbit movie has annoyed me already just because of the year gap and three bleeding installments but I digress! I thought the first Hobbit movie was too long... I suspect the second one will be too. Well... I Dr. J and Mr. H was written by Robert L. Stevenson the others... hmmm I'd have to look them up. I loved The Book Thief. I wonder how they'll do on the movie. And I'm currently reading Ender's Game and having a hard time getting into it. I can't seem to identify with any of the characters. I can't believe I can't name any of those authors. But, I think it'd be super cool for you to do more book genres for your trivia questions! I loved The Book Thief, and can't wait to see the movie. I also look forward to seeing The Wolf of Wall Street. Thanks for the previews Alex! Thor. Sigh. Marking my calendar. I didn't realize #1 was a book, just thought it was a movie...shame on me! #2 Sir Arthur Conan Doyle? #3 Stephen King? (I'm certain of these...not!) no, can't be, not in 1938! No clue. #4 also no clue...sounds like sci-fi and I rarely read it. #5 also no idea. November is definitely going to be a month for geeking out with all those movies. Do I still sound like an adult if I say I'm most looking forward to Frozen? They filled the cast with Broadway stars, I can't help myself! Ivy, glad the Ding Dong comment made you smile. Fran, but it will be so awesome when it's complete. Bish, you're correct. I enjoyed Ender's Game, but I didn't think it was great. Suze, I will make it happen. Sarah, those movies aren't just for kids! I might be getting excited about Days. Bishop looks awesome. I kind of wish The Hobbit would just go away. I'm starting to hate Jackson. I'm so behind on movies. Looking forward to the Book Thief and Thor, especially. L.G. 's pumpkin is so cool I can't even fathom it! Holy crow! And boy- so many good movies coming out next month- which one to watch...? Such an array of movies to look forward. As for The Hobbit, he lives just down the road from me. Cool pumpkin or hot pumpkin. I'm confused, I thought Thanksgiving was early in October. Is there another one besides the Canadian one? Nice one, Jeremy. My human is changing his name to "EXIT", because he always wanted to see his name in lights. Oh, that trailer looks good. Holy casting budget!! I'm in for THOR 2!!! You got me on the authors. I would have to look them up. Thor, I'm all ready for you. So L.G. beat me to the dragon pumpkin. Ah, well, better luck next year. I'll make an L.G. pumpkin first, hahahaha. Pretty much, I want to see every movie on your list. I'm seeing Thor next Wednesday and I can't wait! I'm looking forward to Ender's Game, The Book Thief, the next Hobbit movie, and Catching Fire. And, no doubt, I'll be seeing the Thor flick because my guys are really looking forward to it. Some really great movies coming up! I might actually have to make it over to the theater. :) Looking forward to several of them...think my kids will, too. Me wants that pumpkin!!!! Yes, my pumpkin addiction is getting out of control, heh. Thank you for introducing Madeline short story collection. It sounded very interesting, and so I went to Amazon and downloaded it to my Kindle. Looking forward to reading it. Aw, thanks for sharing the picture of my pumpkin! Now I feel special! The trailers look awesome! I should buy myself some time to watch The Hobbit at a movie theatre. I have to find some good excuse while won't bring my children to this movie with me. I haven't got high expectations towards the Ender's game. The book was great, but according to the trailer the film looks an YA adaptation. Thor... I hope it will good, but who knows. Fun post! I know what I want for to do on Black Friday-movie marathon! All those great looking movies and I'm going, "Yay, Patrick Stewart is back on X-Men!" The X-Men trailer looks good. I'm not too interested in the next Hobbit movie. I was really disappointed with the first part. Which surprised me. I am easily entertained, but the fact they kept jumping from the story of The Hobbit to tie it into LotR jarred me from the movie each time. Congrats to Madeline! Wicked pumpkin skills by LG. That trailer for the Hobbit was great. The dragon is fierce. Absolutely have some great movies on my list for the coming months. Can't wait for X-Men--I so love this franchise. And Enders Game has me crossing me crossing my fingers it's good! Beverly, all the good ones! Gary, ours is next month. And clever - you will see your name in light everywhere. Al, an LG pumpkin would be funny. Raquel, yes you will be! LG, it was an awesome pumpkin! Zoltan, I know they say Ender's Game is young adult, but I don't buy it. And always looking for new board games. I am looking forward the Xmen and Hobbit but first I get to enjoy Thor. Great trailers. There are some great movies coming out. Congrats to Madeline! And L.G., that's one awesome pumpkin! I can remember part of the names on a few of those... drawing a blank on the the full names, though. Pumped to see Ender! But the one I'm most looking forward to is The Book Thief. A gut wrenching read, but one that should be on everyone's list. I need to add a bunch of these movies to my Netflix list for sure. I like those Wall Street thrillers so The Wolf goes to the top of the list. L.G. 's pumpkin carving is amazing! It must have required an awful lot of patience. I still want to see Thor and I guess I will have to go watch Catching Fire for you... hahahaha. Anything by Martin Scorsese is usually pretty good, and I like the sounds of Wolf. The flash fiction piece looks very interesting too. Thanks! We always knew your name would be in lights one day. Well, I'm going to see Catching Fire. I'm definitely more excited to see that than anything (although Thor 2 is a close second). I know 1 is William Peter Blatty and 5 is HP Lovecraft, but I don't know about the rest. I haven't even heard of 3 or 4. Not a big fan of X-Men, but that trailer looks interesting. I am excited to see 'Enders Game', although OSC already warned us that they have changed it. I'll probably see 'Catching Fire' just because, ev3en thought I'm not a big fan of the 'Hunger Games'. Couldn't find your name in lights, but that's probably because I was reading on my phone. I'll have to go back on the computer and check. I want to see the Hunger Games too, but it'll have to wait until the DVD. The books were quite awesome. Notice how none of them X-guys get any older? Guess that's something to do with their mutated powers, don't you think. I need mutated powers, Alex. Congrats to Madeleine... that sounds great, and I don't know how Laura did that with a pumpkin! Can't believe it's nearly time for The Hobbit 2... this year has really flown. There are no words to express how excited I am about the new X-Men. It'd be hard to top the other movies, but it looks like it might! And I'm interested to see The Book Thief as I just finished reading it. And what? No Catching Fire for you??? hahaha . . . LOVE your name in light! Bryan Singer, by far the best X-Director, back together with Jackman, McKellan and Stewart. Oh happy day! Here's hoping he brings the old magic back to the franchise. Thanks for all this lovely trivia Alex. Apologies for not being a regular visitor, I've been unwell. Both trailers are wonderful! I can't wait to see The Hobbit. That last book is H.P. Lovecraft. I love everything he wrote. Jamie, sorry, just not my thing. Thor is a definite as is X-Men and I want to see the Hobbit movies. I passed on the first Hunger Games--no interest in the second, Enders Game--like to see how it's handled in a movie I enjoyed the book, Pass on Wolf, probably see Book Thief on DVD. That is one cool looking pumpkin dragon, LG! Sorry to be so late to visit, Alex. I kept trying to respond at work, but kept getting bounced out -- for some reason. I love how intricate LG's dragon pumpkin is. Very cool. I want to see several of these movies. I saw a recent interview with the Portman and Hemsworth, and she revealed that the difference in their height is so great (she's tiny! ), she approached him in one scene by walking up an unseen ramp. Even then she was a foot shorter than him. Wow the new X-Men movie sounds awesome! Do you think they changed the ending of Ender's Game? The ending in the book MADE the story. Sia, not interested in the second Hunger Games either. Didn't like the first one, but then I haven't read the books. Michael, or the name of a book! Have an awesome time in Columbia. This is going to be an expensive movie month! We have to see the Hobbit, Hunger Games and Thor. Wow, some really amazing movies coming out this month. I am reading The Book Thief right now and it is sooo good. I hope Enders Game can live up to the book, too. Your name in lights is pretty cool, too. I will definitely see the second Hobbit movie, might see Ender's Game (although I'm suspicious of how they're going to Hollywood-ify the story), and will probably wait until video release if I see any others. I also thought L.G's pumpkin was awesome! 1. William Peter Blattey (not sure if spelled right). One of the scariest books I ever read as a young teen. Completely freaked me out for days afterwards. Took a while before I saw the movie. 2. Robert Louis Stevenson. Long-standing classic. 3. Well, there was the Stephen King series, but I'm pretty sure that wasn't written in 1938. No idea who may have written something then -- although it's about the time JRR Tolkien came out with his LotR series, but none had that title. 5. Not sure here either. I started strong, but seemed to have fizzled out with the second half of the quiz, lol! But the Hobbit, AND Ender's Game AND Catching Fire!!?!?! All at once??!! What a freaking awesome trailer for Desolation. I really want to see "The Wolf of Wall Street" and of course Thor. The X-Men trailer left a sour taste in my mouth because of the recycled music, but you already know that. I dunno, it just hit all the wrong keys for me and put me on edge. Of course, I'll still go see it because it's Marvel but whatever. I'm off to see Thor tomorrow. My son made me watch the first one this morning so I know what's going on - he's taking a personal interest in my Marvel education! Congrats to Madeline - what a fantastic cover her book has! This fall/winter is going to be super busy with all those movies I needs to watch! I'd really like to see the Book Thief. I bet it will be a great movie! David, that made me laugh! Michael, the music sounded good to me. Annalisa, at least you will know what is happening. Thanks guys! Jeremy did a great job with the lights. Looks like a great month for movies! I have been enjoying a couple of TV series as well, American Horror story is very good this season and Sleepy Hollow has promise, enjoy....enjoy, holiday treats for the season! As a total dork, I'm really excited to see X-Men, The Hobbit, Thor, etc. Minus the Hunger Games, which I just was never able to get into. I carved a pumpkin this year, too. It's called "forgot to carve it so it's rotting away on the front porch." It's, uh, modern art because it's ironic. Or something like that. I've got to see some of those movies! Thanks for stopping by my blog- it's been awhile and I'm starting to get into the swing again. I'm going to see ENDER'S GAME for very sure. I too, want to see what they do with it since they've already started with making him too old... And Harrison Ford? Really? Looks nothing like his character's description in the book. Oh well, could still be good. And of course the Hobbit is a must see. I'll check out the others as I haven't heard of them. Thanks Alex!!! Forgot to say I'd also see the X-Men! Looks good, though I'm a bit tired of everyone being so depressed. Interesting The Wolf of Wall Street! I am so excited for The Hobbit #2!!!!!! November is going to be an AWESOME month. I am so excited about every movie on your list. I cannot wait. Brandon and Bryan, modern art works! I never got into the Hunger Games either. Lisa, we'll see what they do with it. I adored The Book Thief, so looking forward to that one. That Wolf of Wall Street looks good too. The Book Thief is on my to-read list. Looks like I'll need to get it done before the movie! Those movie trailers look great! I can't wait to see both movies. First, though, Thor! I'm looking forward to seeing Enders Games too. Of Course I googled them except for the Exocist. William Blatty-The Exorcist Robert Louis Stevenson-Dr.Jeykl & Mr. Hyde CS Lewis-The Dark Tower Tim Powers-The Anubis Gates HP Lovecraft-At The Mountain of Madness. Words fail to describe the excitement I feel!!! The Book Thief coming in film. Oh my goodness. That is an awesome book. I like Wolverine better without his arms all covered up like that. What the heck is that? I don't like that. PS: Gotta tell ya, I am enjoying Feedly a great deal. Especially for coupon updates and reading. So much faster, I cannot even say thanks enough for doing that post on it awhile back. Thanks for the upcoming movies list. I did not know The Book Thief was coming out as a movie. I love that book! I can't believe I'm saying this, but I'm -really- excited about The Hobbit. The first part really grabbed me...and I hated the book. That was a great GREAT PUMPKIN. Linus would be proud. Seeing Enders Game tomorrow! We barely survived October with the lame movie selections . . . now we'll be seeing a fun movie every week! Yeah! And that dragon pumpkin is ah-MAZING. Sorry for the late appearance. The Book Thief was the best book I read last year. Lots of great stuff happening. I loved "The Book Thief." I saw the trailer and have great hopes for the movie! A lot of movies coming out! I haven't read Ender's Game but I'm wondering if I should wait until after I see the movie. I haven't heard of Frozen until just now. I guess giving movies one word titles is a thing now (Brave)? Congrats to all the new books coming out, I will try not to forget the Insecure Writers on Wednesday also the blogfest on Friday. I really want to see the new X-Men movie. I liked the last one with that current cast. First off, how very cool to see your name in lights. -I'm very much looking forward to the next X-Men movies, but I refuse to watch trailer of it or any other movie I know for sure I want to see in the theaters. I must have 100% anticipation to see movies now, I've spoiled myself too much in the past. -I too am interested to see what happens with the Ender movie. I heard that Ender's Game was an okay movie, but I hope it's at least okay. I'm very, very excited for The Book Thief. It is one of my favorite books that I've ever read. As for Catching Fire, I'm reasonably excited. Hopefully they didn't completely mess it up. The Hobbit...of course I can hardly wait! I hadn't even heard of Frozen before. It's sure to be epic. Right. And that's a seriously epic pumpkin. Much more epic than Frozen.